There is a place in the spotlight for learners like Aislynn Cates, a sixth-grader at Falcon Middle School. 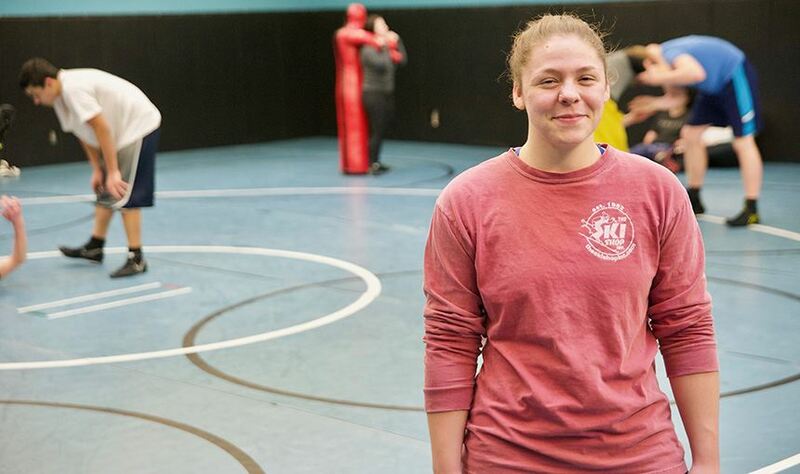 “It made me feel unique, and like I can do anything,” shared Cates. 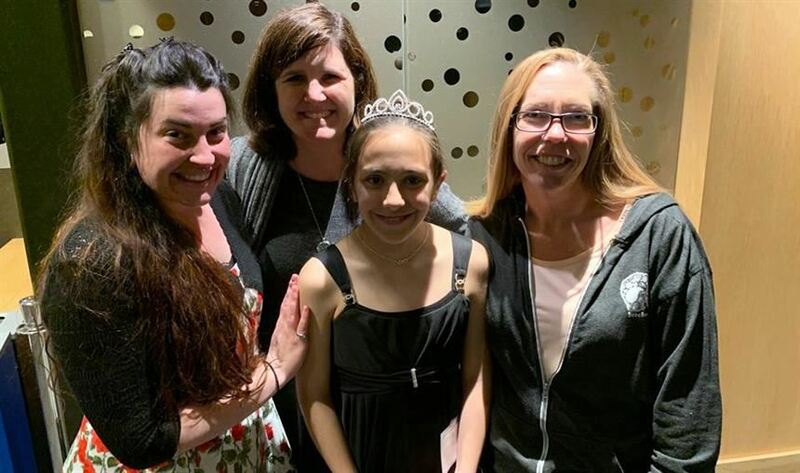 She and other D49 students took the stage at the Colorado Miss Amazing pageant March 30. The event transcends pageantry, creating a platform for girls with disabilities to have their voices heard and their faces recognized. 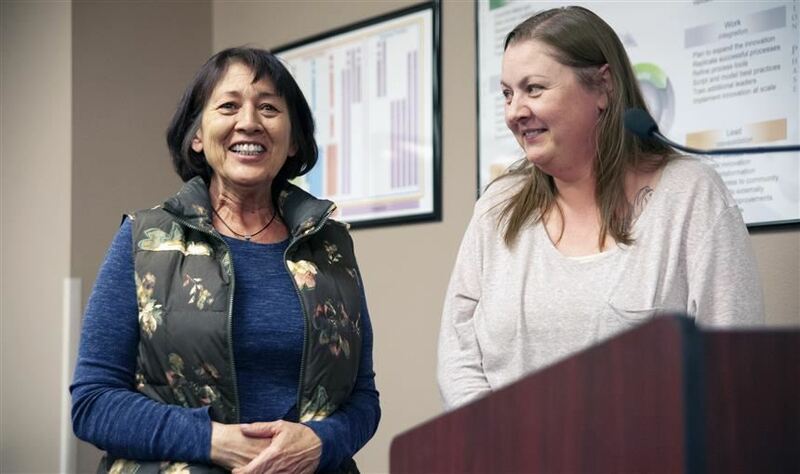 Individuals in D49 aspire every day to make our educational community the “Best Choice to Learn, Work and Lead.” Before the monthly board of education work session March 27, one staff member and two students were celebrated during Fantastic 49 for leading in notable ways. 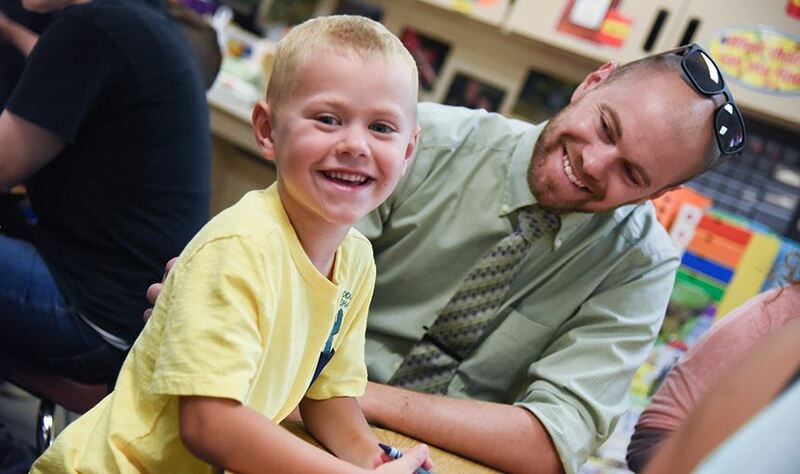 Individuals across District 49 aim for excellence every day. 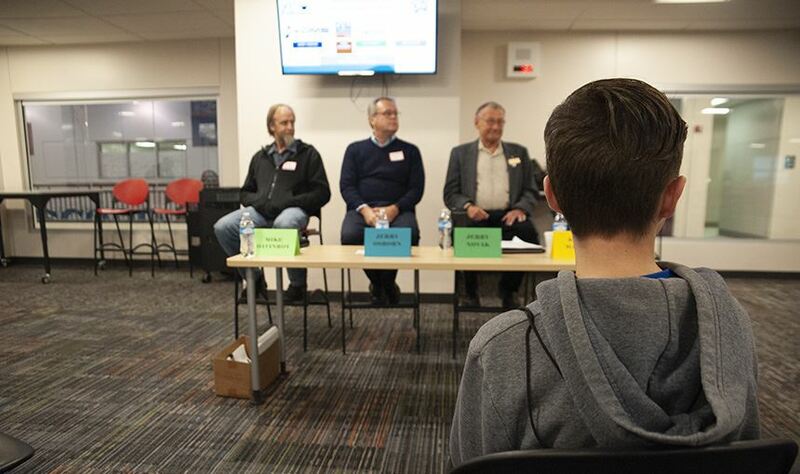 For some, it encompasses working hard in and out of the classroom. For others, it is about demonstrating D49’s values on a daily basis. The board of education honored four individuals during Fantastic 49 festivities before the regular board meeting February 14 for their commitment to always going above and beyond. 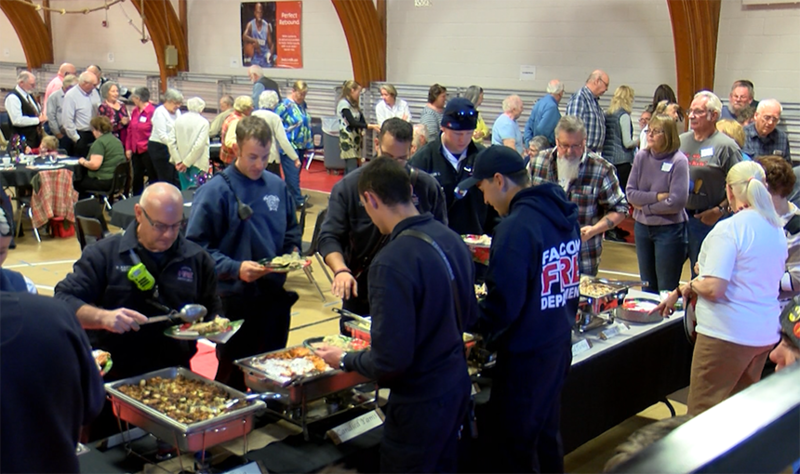 A crowd of more than 400 attendees including elementary, middle and high school students with their parents in tow gathered for the evening to recognize the work taking place with Student 2 Student (S2S) programs around Colorado Springs. Download the D49 APP Today! 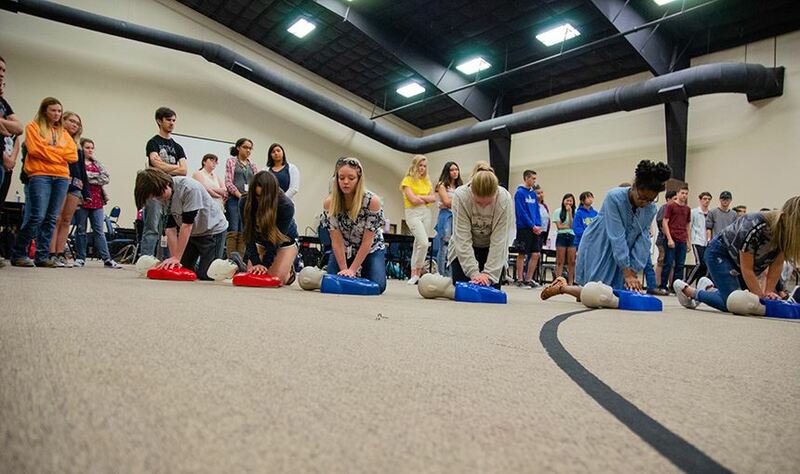 More than 60 students and staff earned CPR certifications from this event, co-organized by PPEC senior Kaine Greathouse. 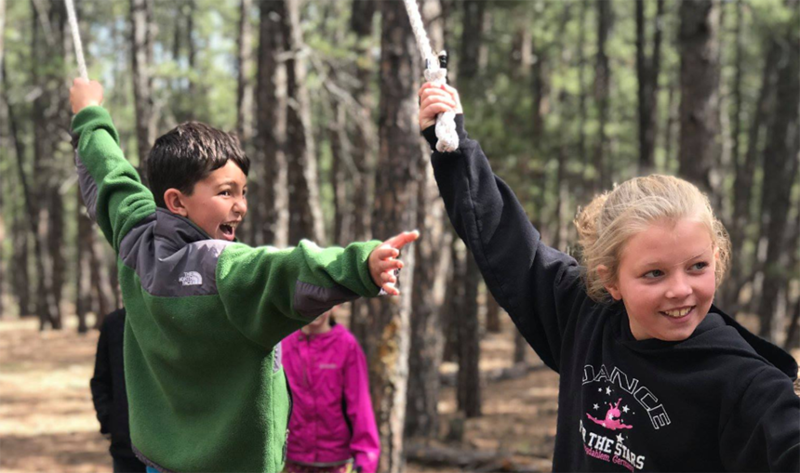 Thanks to partnerships with local military installations, D49 students with parents who serve in the armed forces have programs available made just for them. 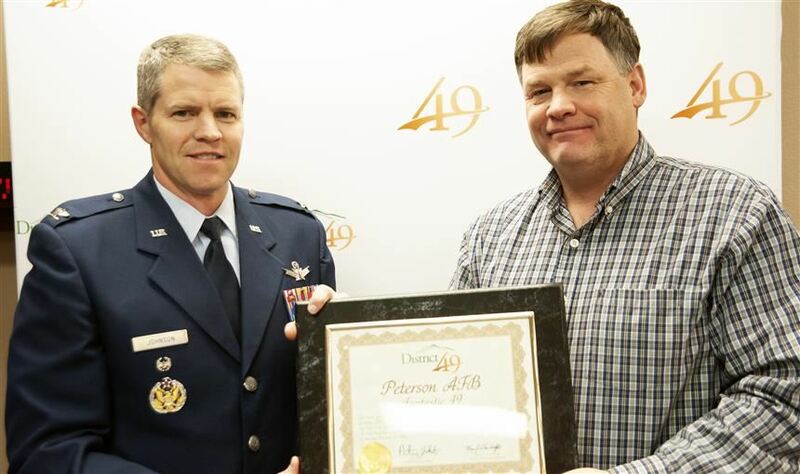 During Fantastic 49 festivities Dec. 13 before the regular monthly Board of Education meeting, Fort Carson, Peterson Air Force Base and Schriever Air Force Base were honored for their collaborative support of District 49. 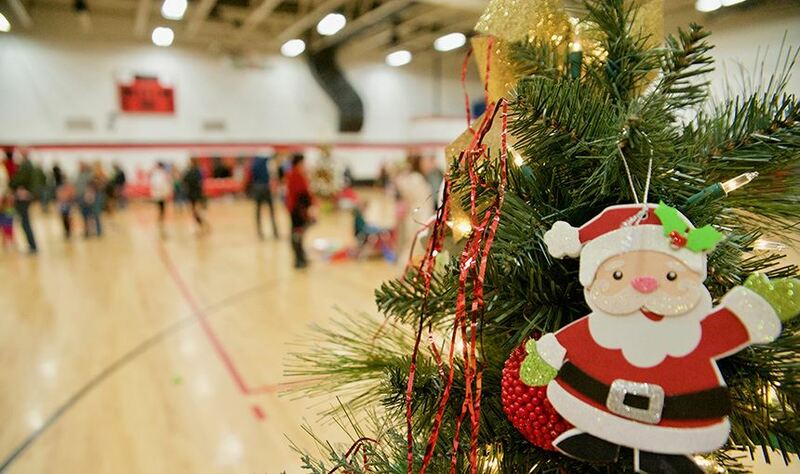 The JOI Club turned the HMS gym into a Christmas wonderland Dec. 8. for its annual day of service. 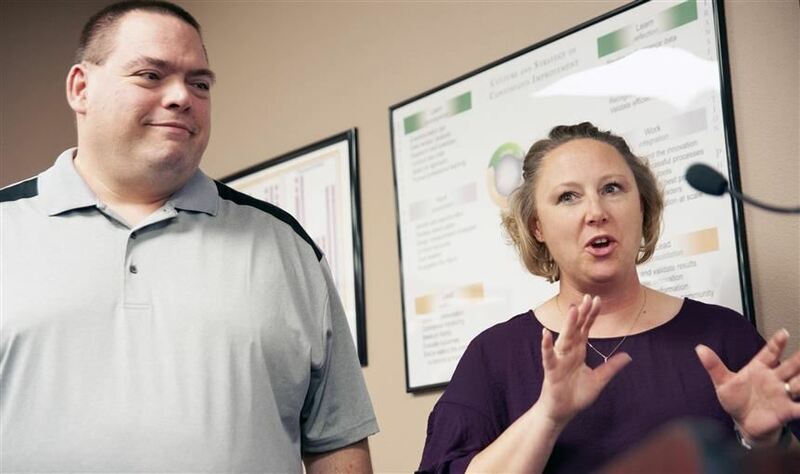 Teachers around the globe have latched onto the concept of Caine’s Arcade, a project-based curriculum that teaches students how to use innovation in creating projects from inception to completion. 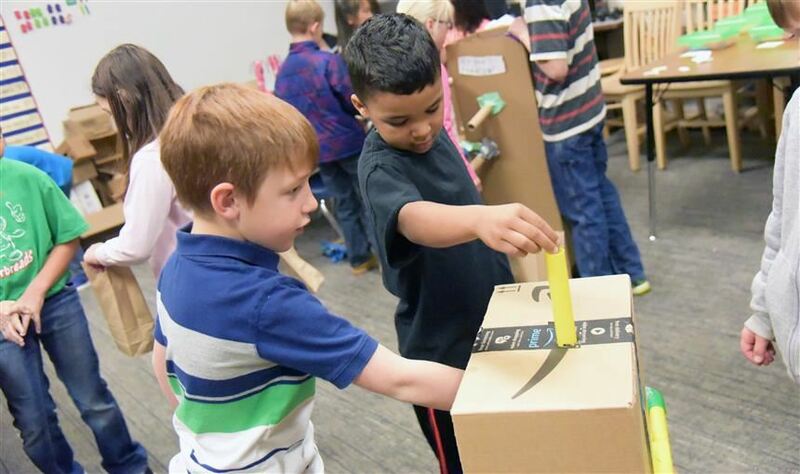 During November, students in Mary Hopper’s project-based learning classes at Woodmen Hills Elementary were given the opportunity to take on the cardboard arcade challenge. The little artists drew pictures and took photographs, and the accolades accompanied their hard work. 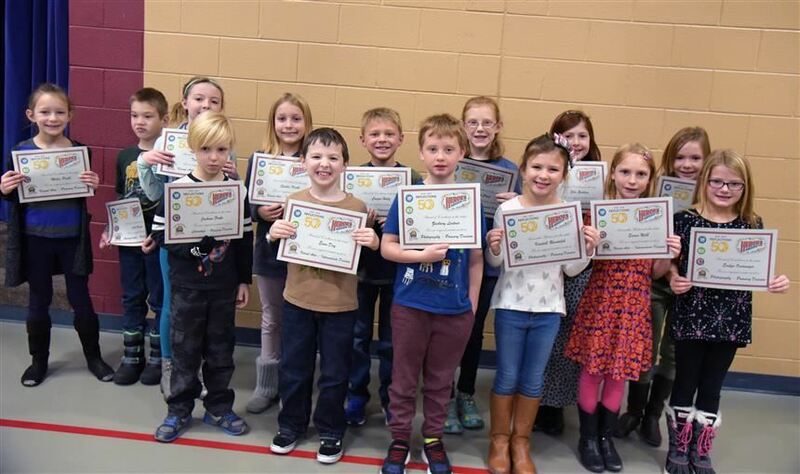 Fourteen students at Meridian Ranch Elementary School received awards Nov. 26 as part of the national PTA Reflections contest. 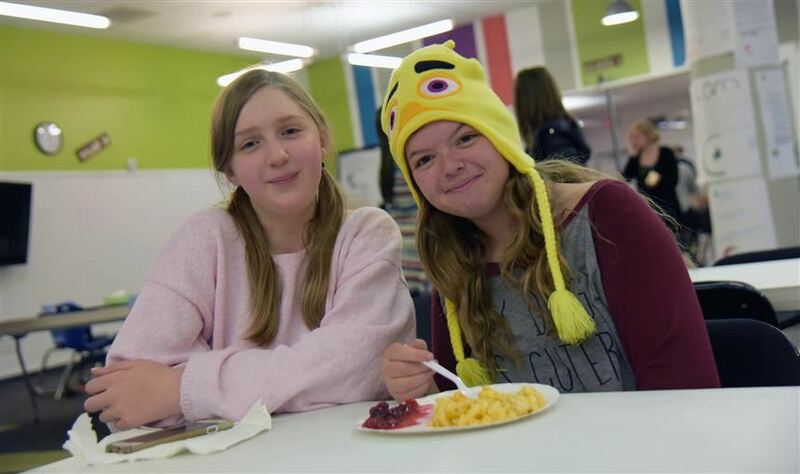 Food and carnival games were ripe for the picking at the Springs Studio for Academic Excellence Harvestmania event Nov. 9. 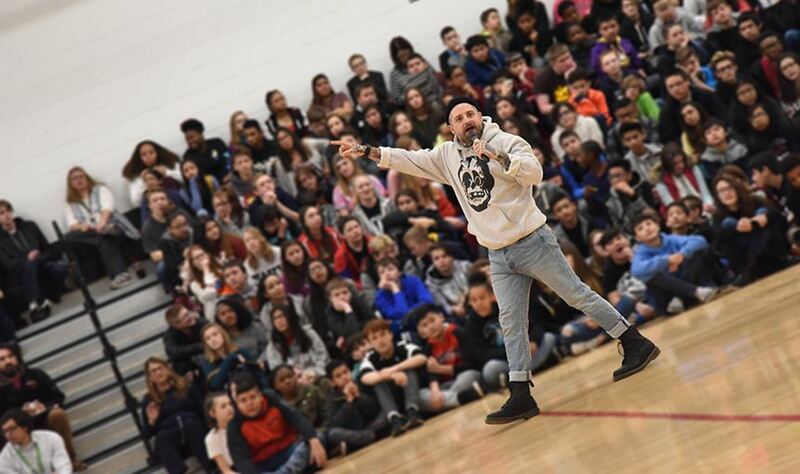 Students and staff gathered together to celebrate the season, and to raise money for Care and Share Food Bank for Southern Colorado. Meridian Ranch Elementary School celebrated Veterans with a patriotic concert on November 15, 2018. 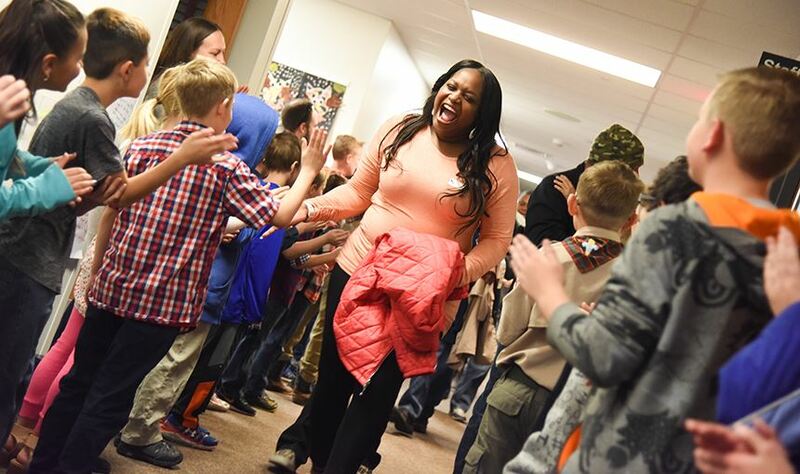 Kenyada Gilbert, Army veteran, was cheered as she walked out of the “Meridian Ranch Clapout” after the Veteran’s Day concert. Lisa Ghrayyeb-Hartman, Evans International Elementary School counselor, meets with the Neonatal Intensive Care staff at Penrose-St. Francis Hospital, Nov. 15. 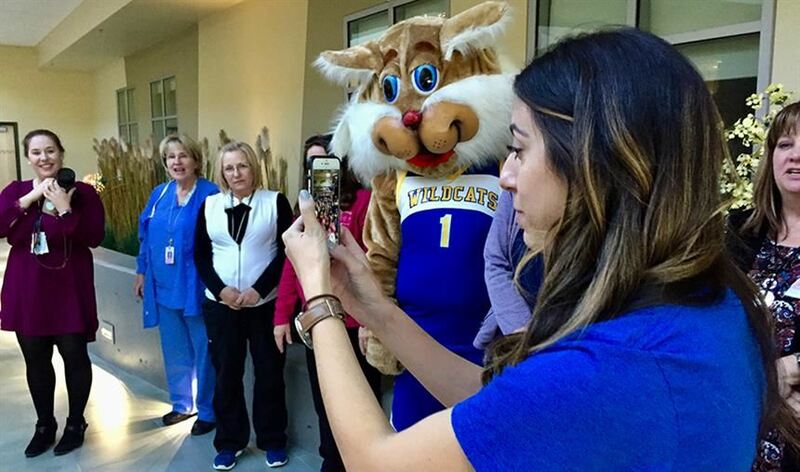 EIES staff members delivered donated items collected by third grade students to the hospital while students watched via a live video call. Patriot High School culinary arts students cooked and served food for over 100 Falcon community members during the school’s annual pre-Thanksgiving luncheon, Nov. 14. The list includes captivating projects from a science escape room to a nature store trading post. 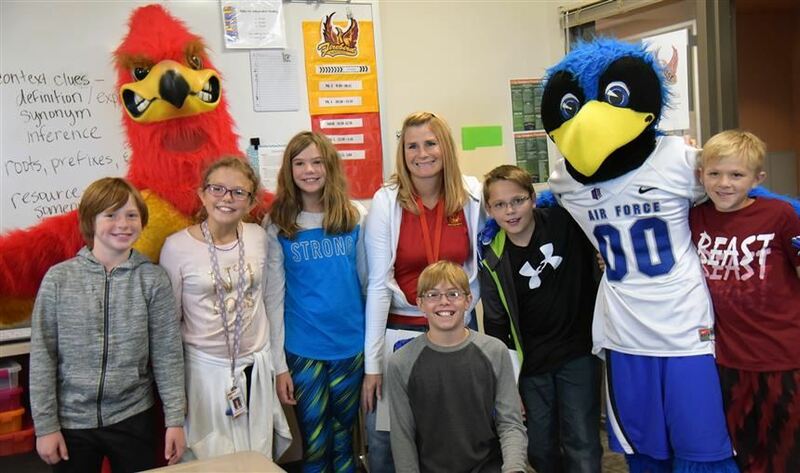 Thanks to the Falcon Education Foundation, students in District 49 will be exploring and learning from unique classroom experiences. 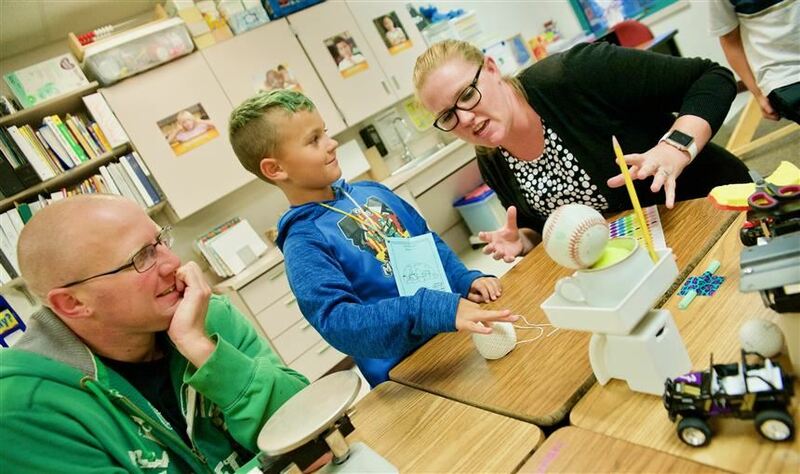 Thirty-seven teachers received mini grants for innovative classroom projects during Fantastic 49 festivities before the Nov. 8 board meeting. 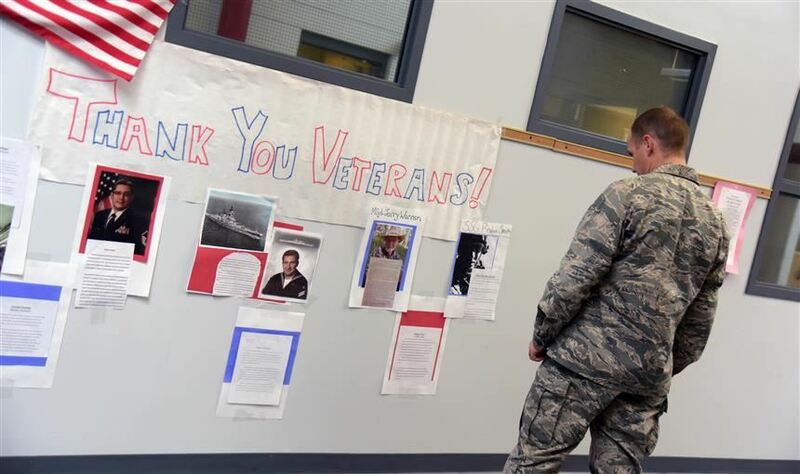 Students, family and community members gathered at Falcon Elementary School of Technology (FESoT) on Tuesday evening, Nov. 13, to celebrate Veterans Day. 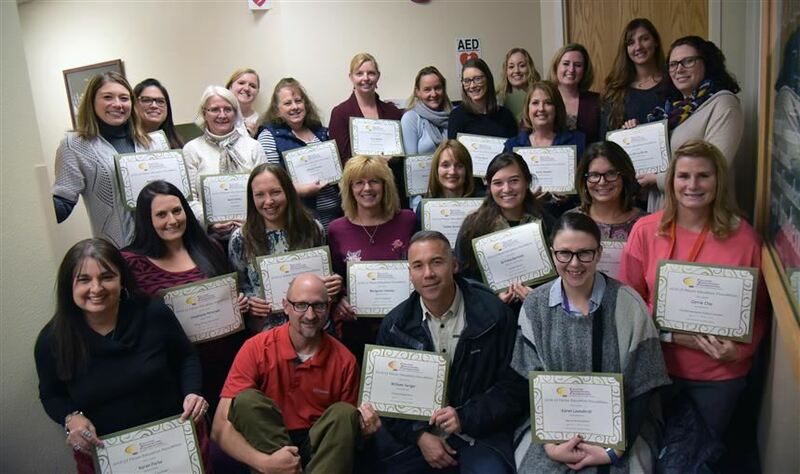 District 49’s DoDEA grant funded program, BRIGHT, hosted its first annual Rocky Mountain Restorative Practices Conference, November 8-9, 2018 at the Great Wolf Lodge in Colorado Springs. 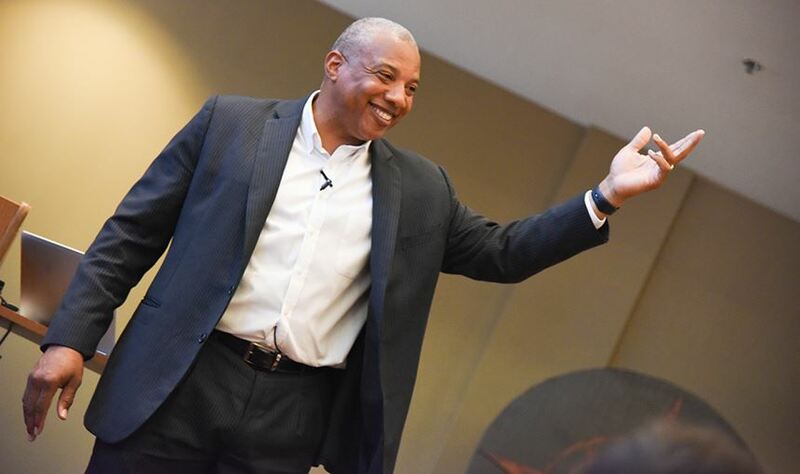 John Register, keynote speaker, kicked off the conference Thursday morning with an inspiring message. 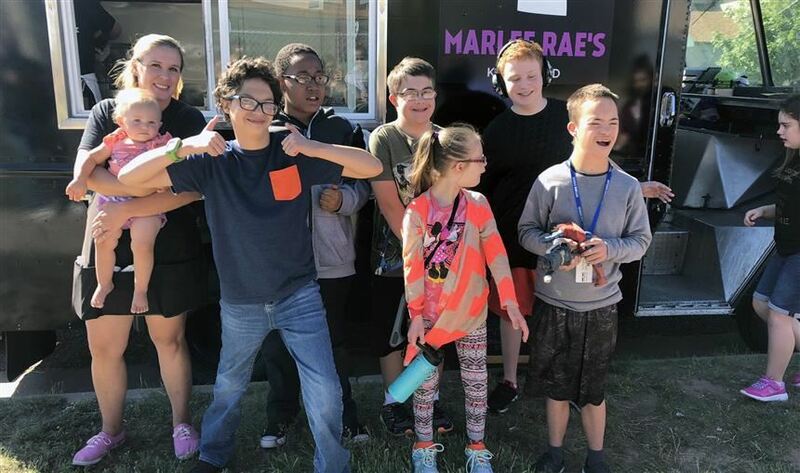 School District 49’s Pathbuilders team developed the Get a Life Expo to offer an engaging experience of discovery for students in middle school and early high school. 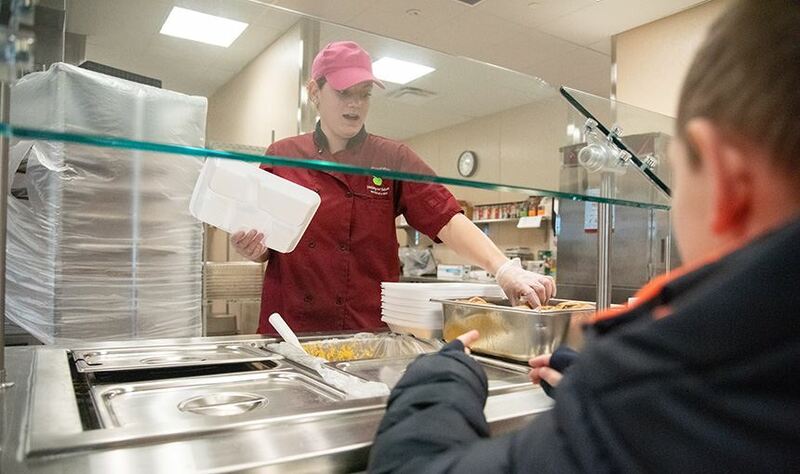 If a D49 student needed something fun to do during summer break, all they had to do was ask someone in, of all departments, nutrition services. 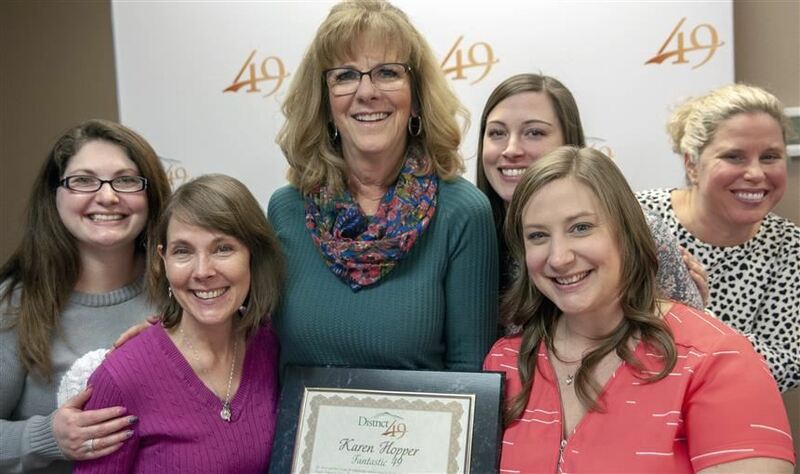 Michelle Suggs and Sophie Bettendorf made that part of their commitment to the D49 summer meal program, which also made them Fantastic 49 honorees for October. Somewhere in a cup of instant pudding-powder mixed with a few tablespoons of water and a gummy worm is a lesson about science. A place to exercise body, as well as mind. 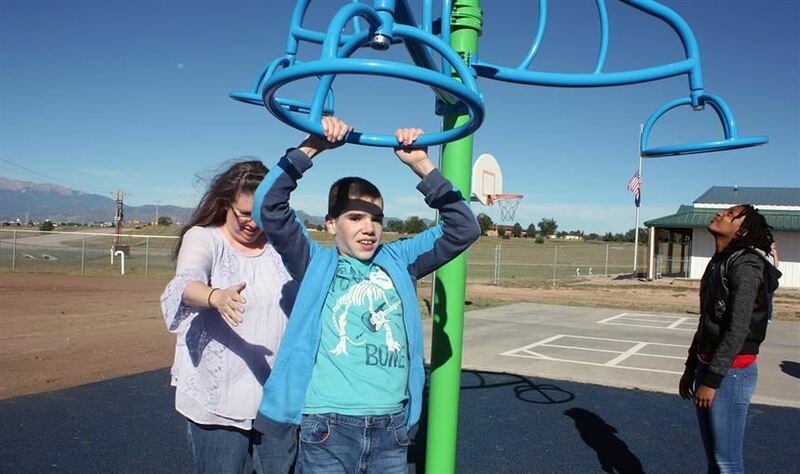 A newly installed playground for students at the PEAK Education Center created just that. Students and staff celebrated their new activity area with a ribbon cutting ceremony Aug. 30. 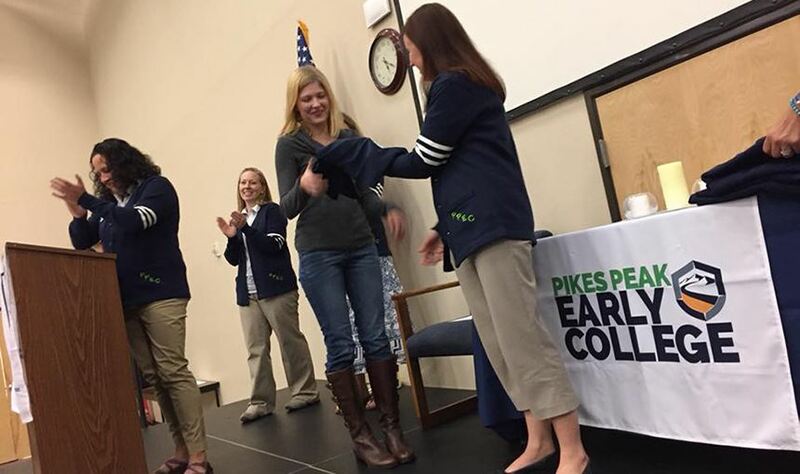 Olivia Kirschbaum, a senior at Pikes Peak Early College, who is also enrolled in her first full year at Pikes Peak Community College, receives her 3.75 academic lettering sweater from principal Rochelle Kolhouse, Sept. 24. 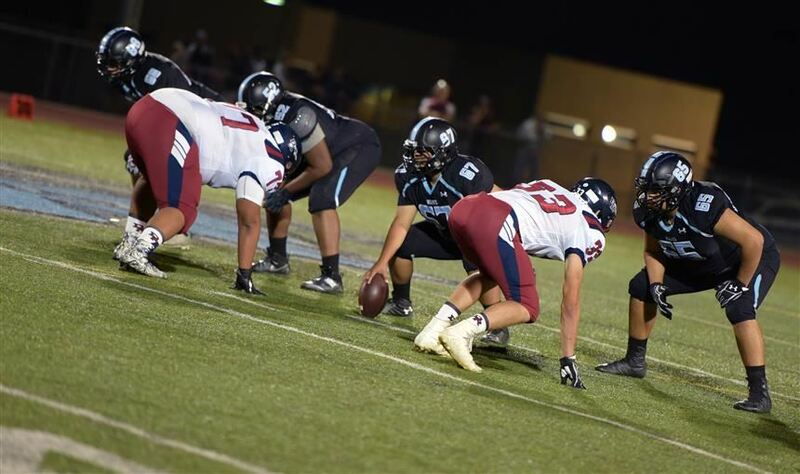 Senior varsity football players, Robert Long (#82), and Christian Pramberg (#1), prepare to charge the field in their last homecoming game at Sand Creek High School, Sept. 21. 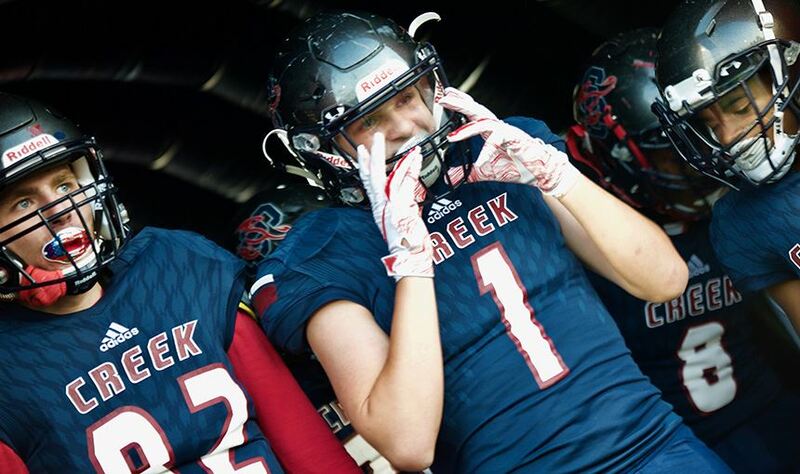 School pride was in the air, and cheering fans were in the stands, as the Vista Ridge High School football team stood ready for competition. 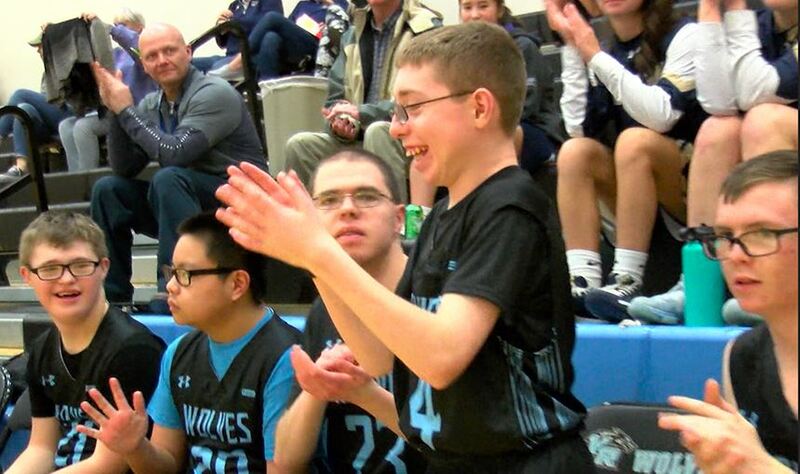 The Wolves celebrated homecoming Sept. 14 with a football game and fanfare. 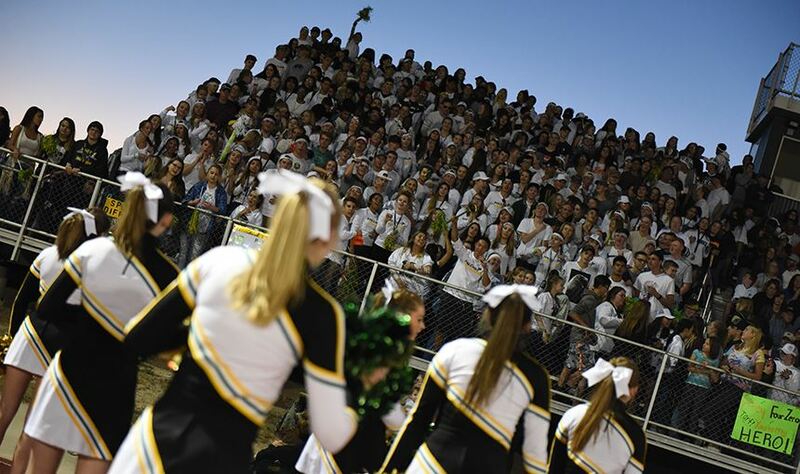 Friday night-lights in Falcon were bright for Falcon High School’s homecoming activities on Sept. 14. The festivities included fireworks, football game, homecoming court crowning, and special alumni cheer presentation. 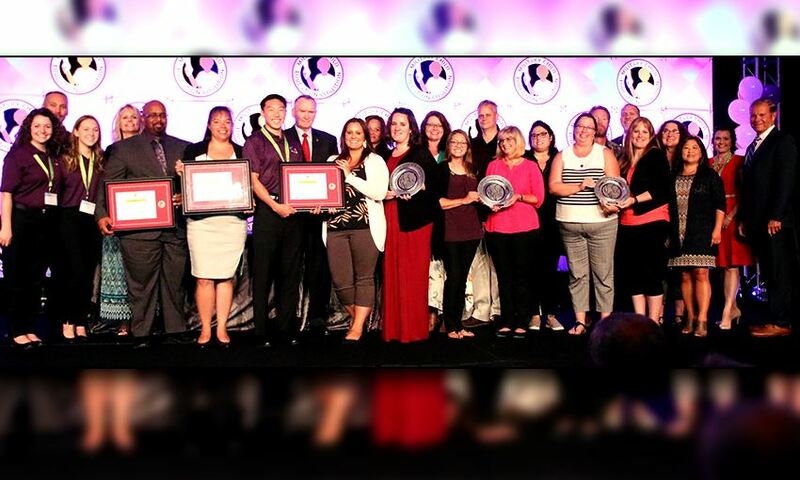 Seventeen D49 teachers received accolades from principals, and recommendations from students and parents to prompt selection as their school’s Teacher of the Year. 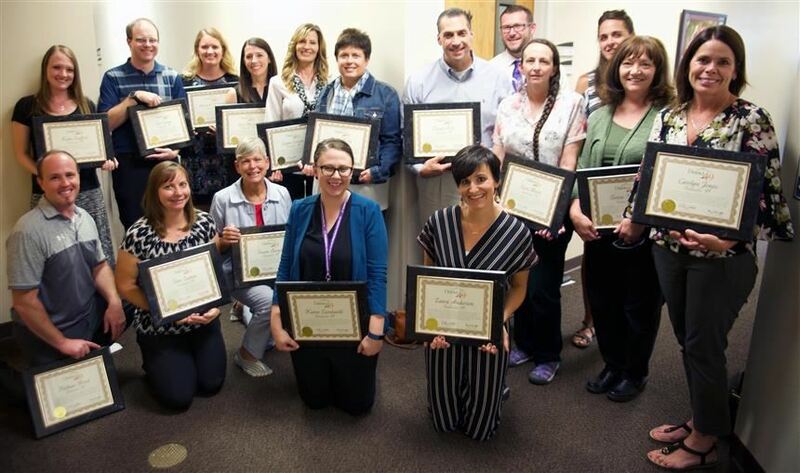 School District 49, in conjunction with its esteemed partners at Peterson Air Force Base are recipients of the 2018 Pete Taylor Partnership of Excellence Award™. Quiet hallways are not an indication summer break is in full swing at Falcon Middle School. 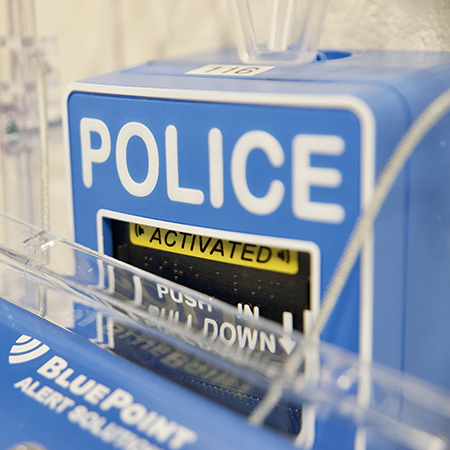 Behind closed doors, on the first day of school, rooms were buzzing with activity on August 2. 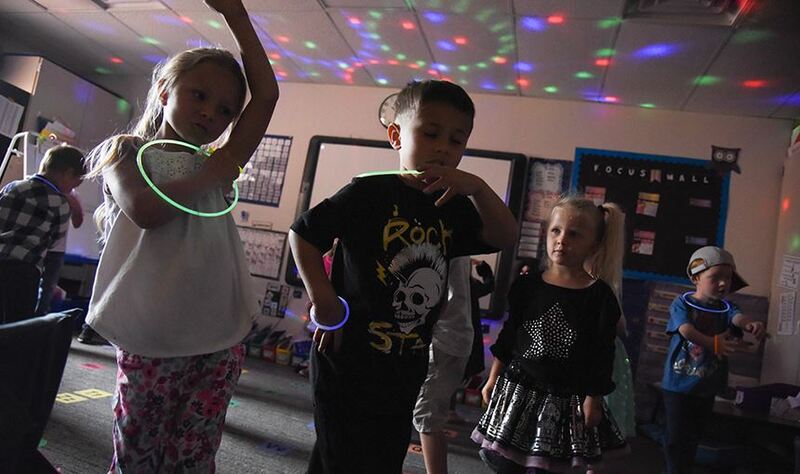 Woodmen Hills Elementary School may have welcomed some new students for the first day of class Aug. 2, but some things were as constant as ever. 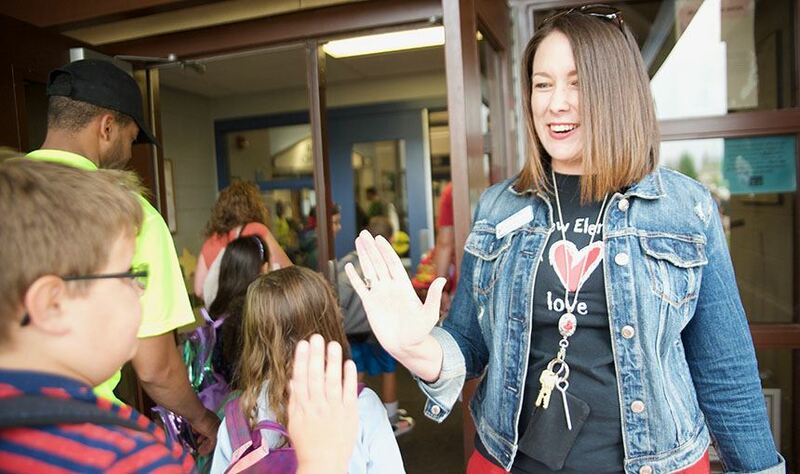 As young learners arrived, several long-standing staff members were there to greet them for another year. 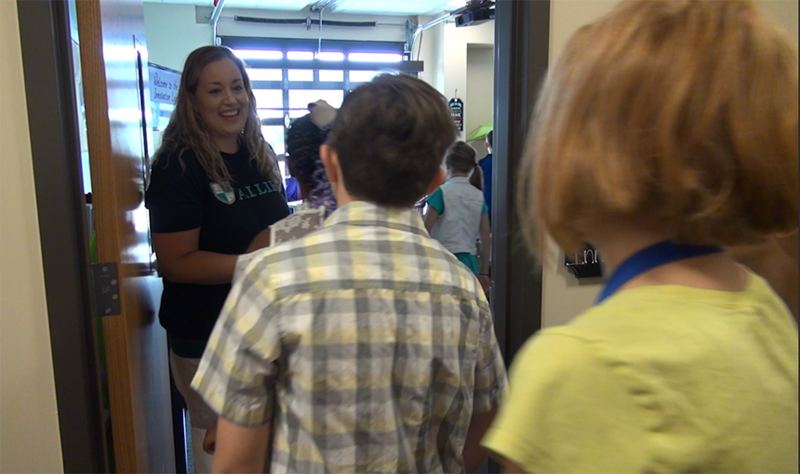 Ridgeview Elementary School picked up right where it left off on the last day of school before the start of summer break. 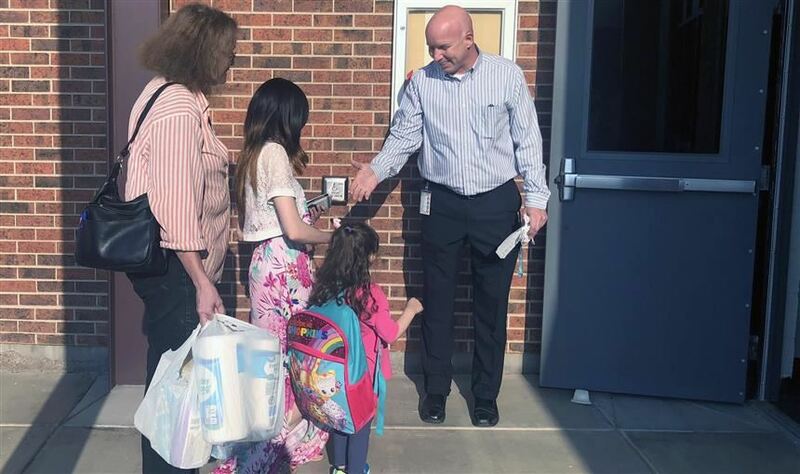 On the first day of school, Friday, August 3, Andrea Aragon, RVES assistant principal, greeted every student at the front door. 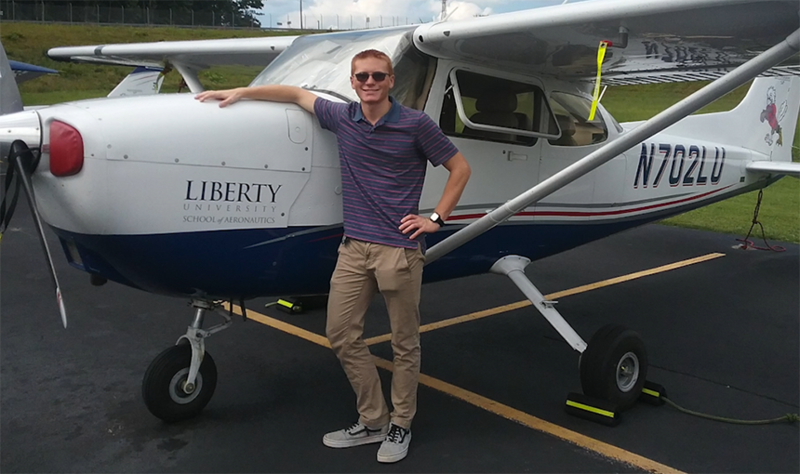 AFJROTC cadet commander Mark Wilson starts his senior year at VRHS, after earning his private pilot’s license during summer break. New District 49 and Odyssey Elementary School kindergarten teacher Deanne Thoden, greets her students on their first day in class, Aug. 3. 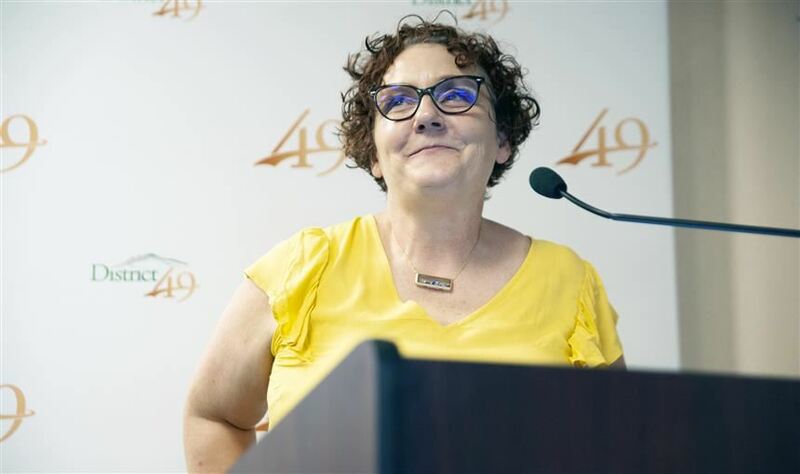 Stephanie Hazelton, Innovation Lab teacher, greets students as The Academy for Literacy, Learning & Innovation Excellence opened its doors, Aug. 3. 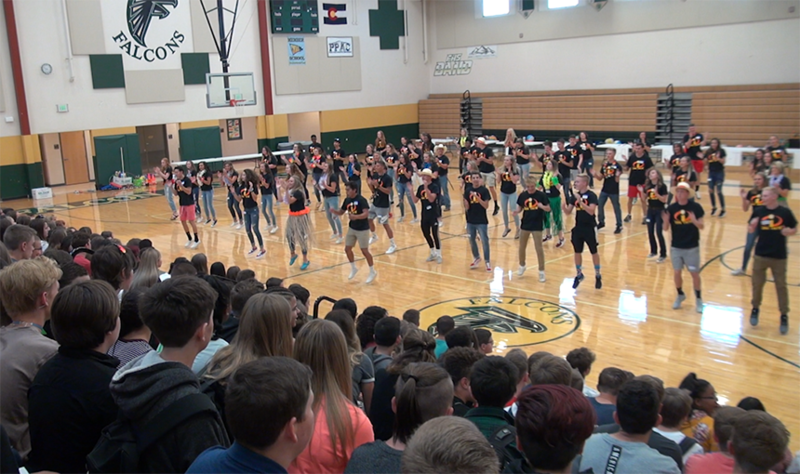 Falcon High School Link Crew members pump up the incoming freshman Class of 2022 during orientation day, Aug. 1. 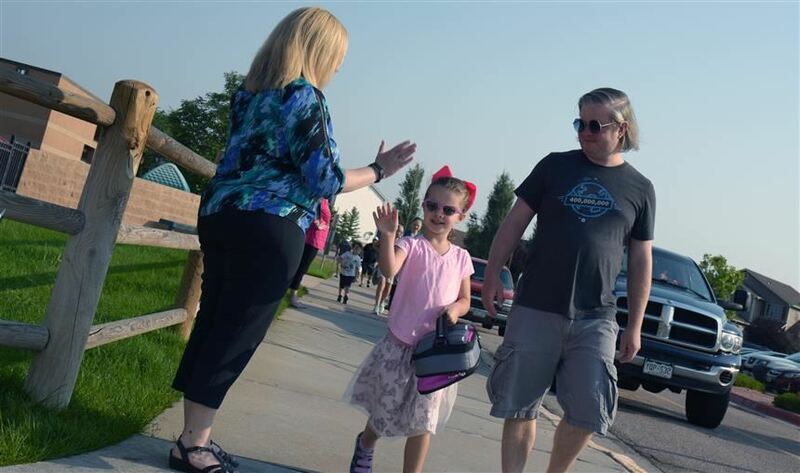 Evans International Elementary School welcomed over 580 students for the 2018-19 school year on Aug. 2. Students and families gathered outside on the field for a day of reunions. 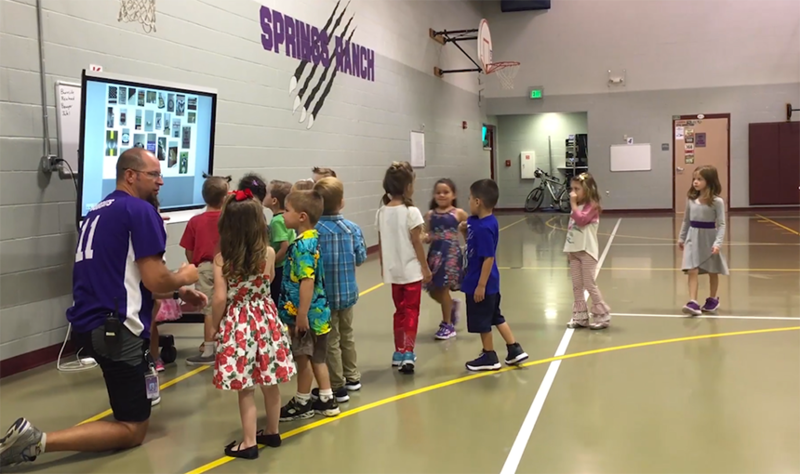 SRES physical education teacher Jeff Ingram greets kindergarten students, Aug. 1. Young and excited scholars arrived at Falcon Elementary School of Technology August 1 and 2 for kindergarten orientation. Kindergarten is all about laying the groundwork for learning in the years to come. 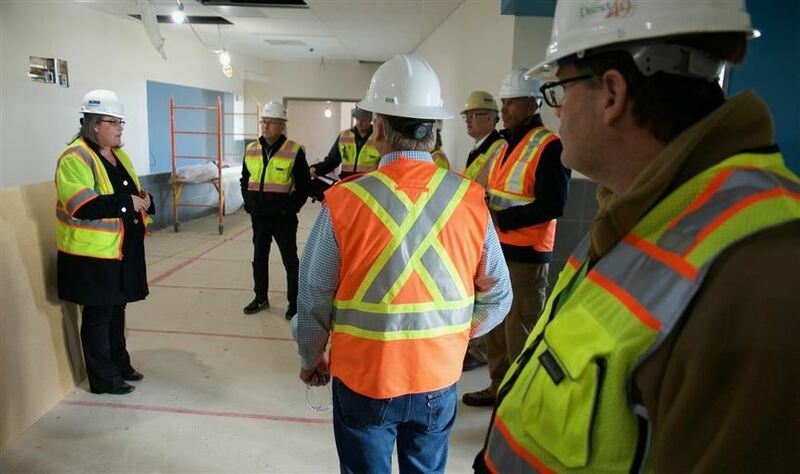 Three major projects at School District 49 are ready for the start of school year 2018-2019. 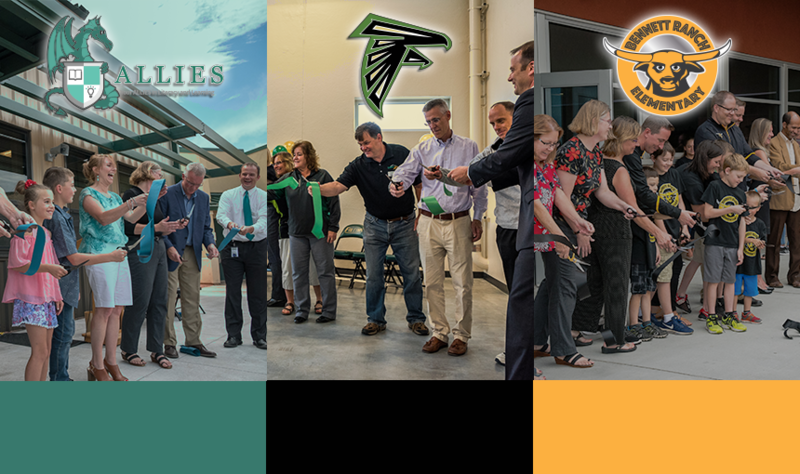 To mark these milestones D49 hosted three ribbon-cutting ceremonies, on three different days, a week ahead of the first day of school. 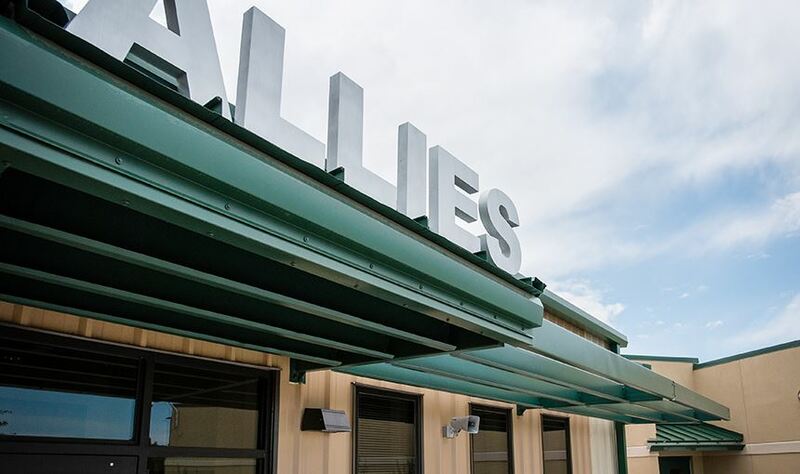 Please join District 49 as we celebrate the opening of ALLIES with a ribbon cutting ceremony. 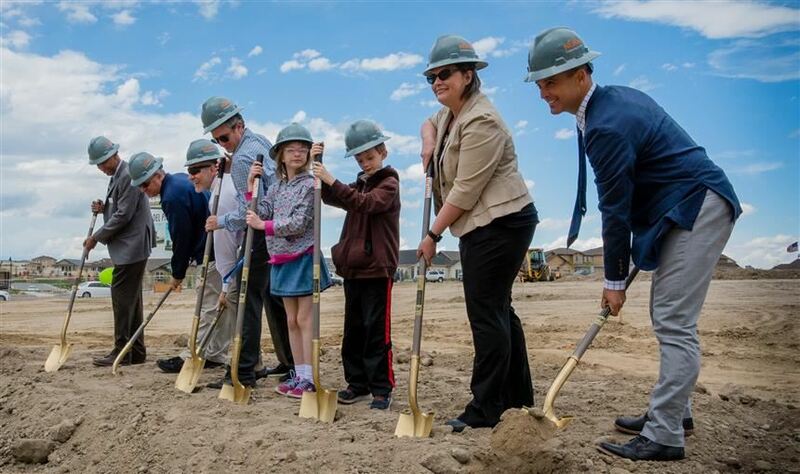 We invite you to join us for the ceremony and to take a good look at a benchmark achievement in the D49 Building our Future Community plan, Wednesday, July 25th at 3 p.m.
District 49 is thrilled to announce the completion of major construction projects made possible with the 3B MLO funding approved by taxpayers in the fall of 2016. Our school leaders and esteemed guests will celebrate these milestones and offer an up-close look at our new, and upgraded, buildings. 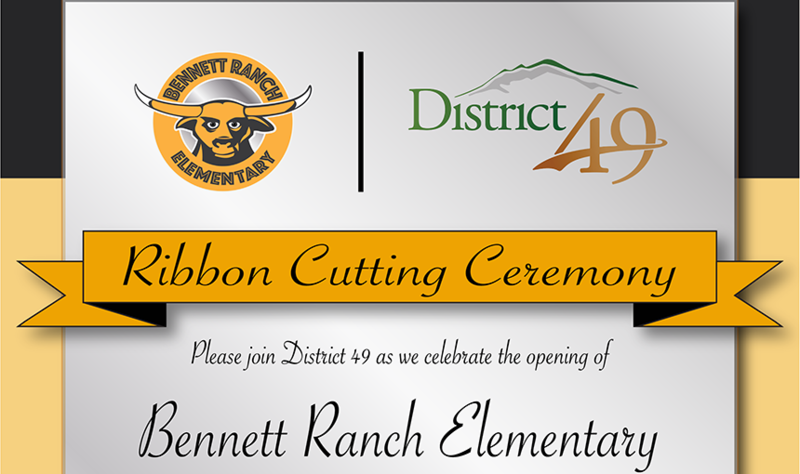 We invite you to attend our ribbon- cutting ceremonies beginning the week of July 23, starting with Bennett Ranch Elementary School! The life of a military student is challenging. Frequent moves across the globe bring constant change and new beginnings. 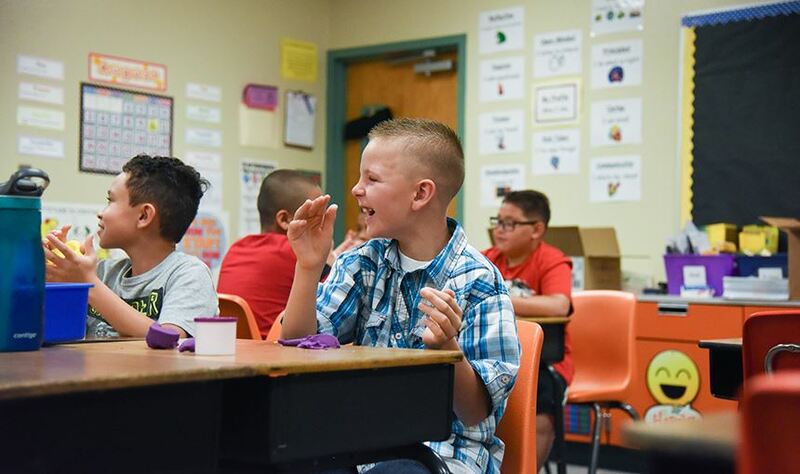 “Being a military kid can be hard, but things like this make it easier,” said third-grader, Becky Simpson. 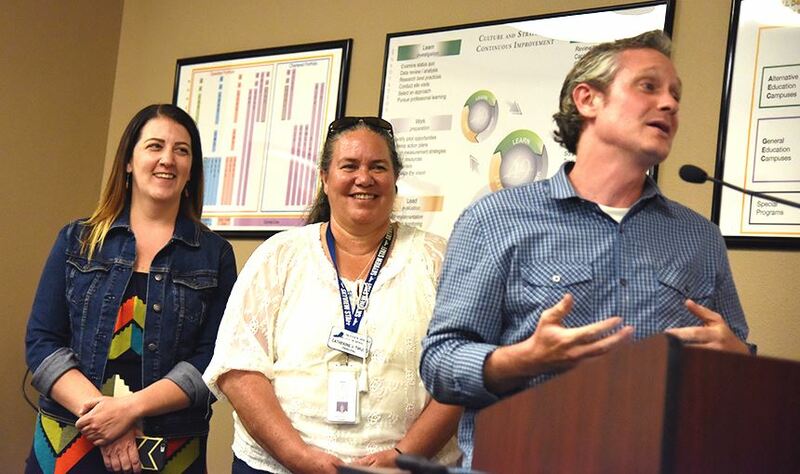 Three District 49 staff members were honored June 14 for their achievements in the district prior to the regular monthly Board of Education meeting. 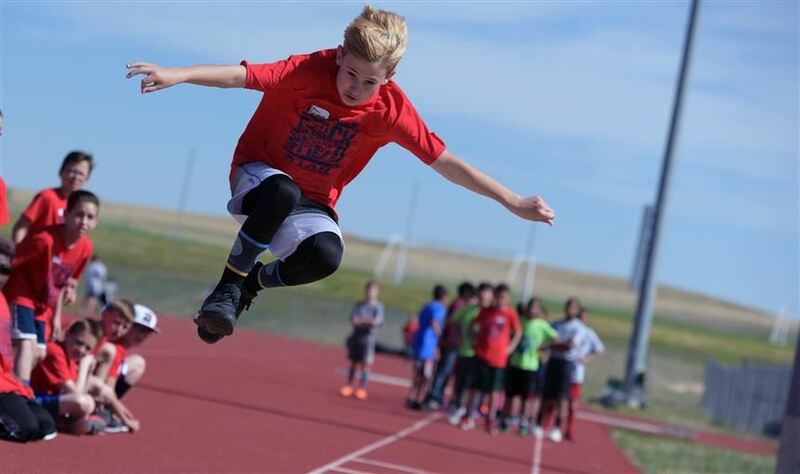 Nearly 400 fourth and fifth-graders from 10 schools across D49 participated at the all-district track meet May 17 at Falcon High School. 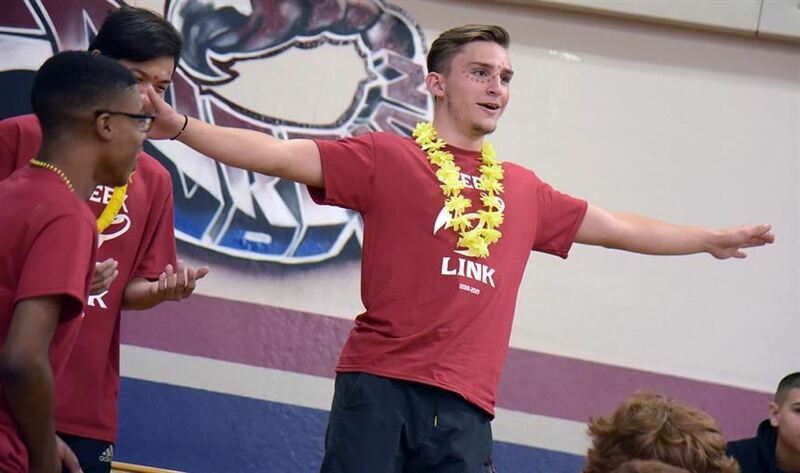 Students were gathered together to practice physical education skills learned throughout the year and to experience competition. 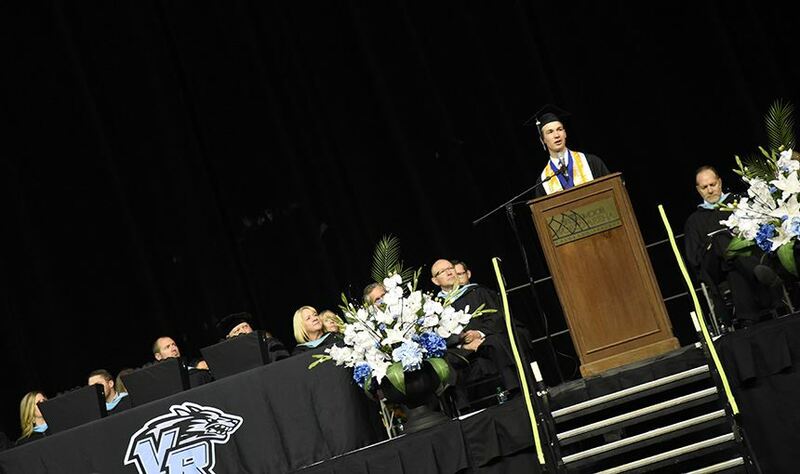 Families, friends and graduates gathered at the World Arena on the morning of May 26, 2018 for Falcon High School’s Class of 2018 Graduation. 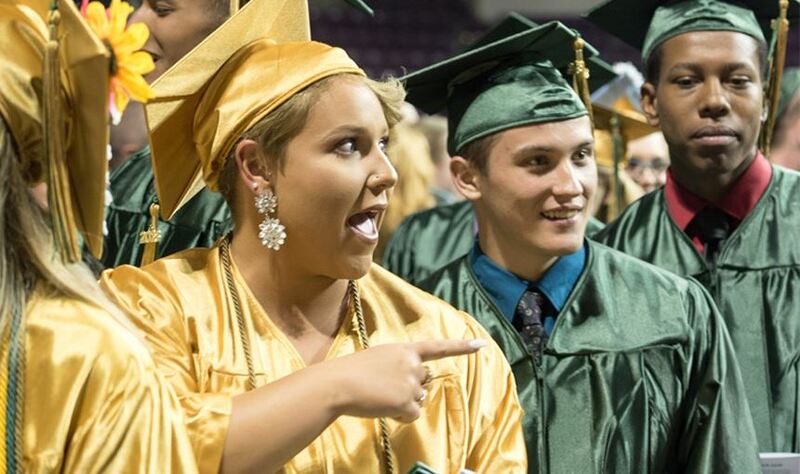 Falcon’s 2018 class had 242 graduates receiving their high school diplomas Saturday morning. Graduates quietly lined up in the tunnels before entering the world arena floor to kick off the event. Band music serenaded the audience during the gathering of family and friends for the Class of 2018 graduation of Vista Ridge High School on Saturday, May 26, 2018 at the World Arena. 325 Vista Ridge graduates filed into the World Arena floor to “Pomp and Circumstance” performed by VRHS band. Sand Creek High School graduates and family members waited to enter the World Arena late afternoon on Saturday, May 26, 2018 for the Class of 2018 Graduation Ceremony. 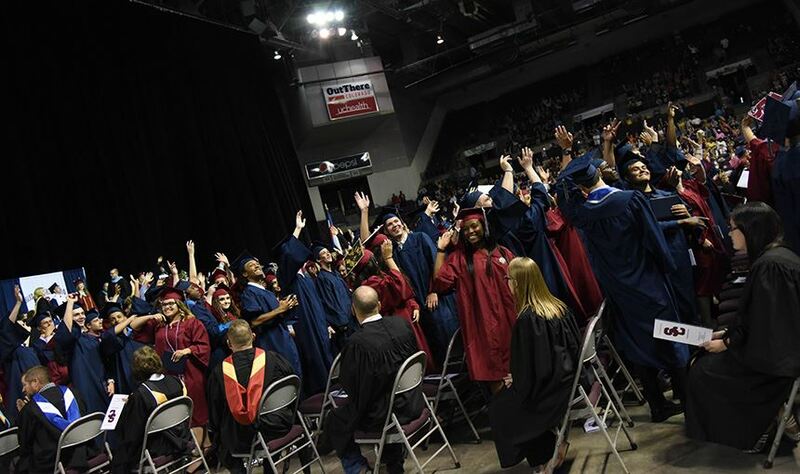 274 Sand Creek seniors received their diploma on Saturday. 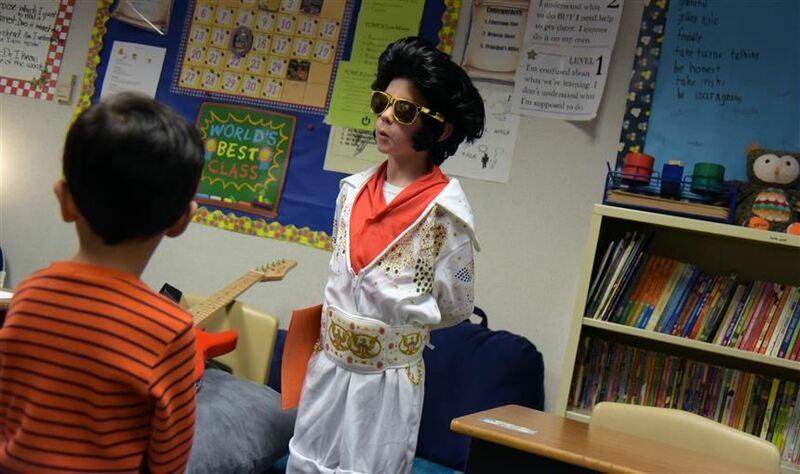 Science experiments, a wax museum, math bingo and a book walk were just some of the highlights of the “Learning Through the Decades” night at Stetson Elementary School May 15. A room full of Pikes Peak Early College students sat quietly at tables surrounded by their family and friends early in the afternoon of Friday, May 18. It’s the season for celebrating the milestone of completing a K-12 education. 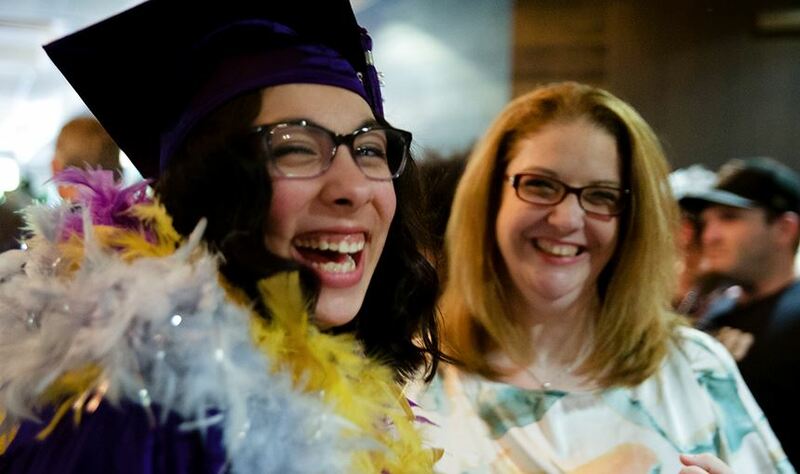 For area homeschool students, graduation is no exception. 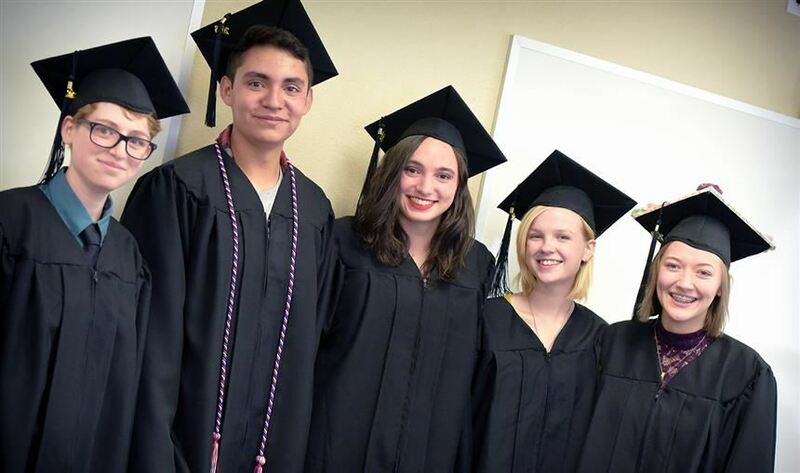 Five homeschool high school seniors were honored for their completion during a special ceremony May 19 at the Creekside Success Center. 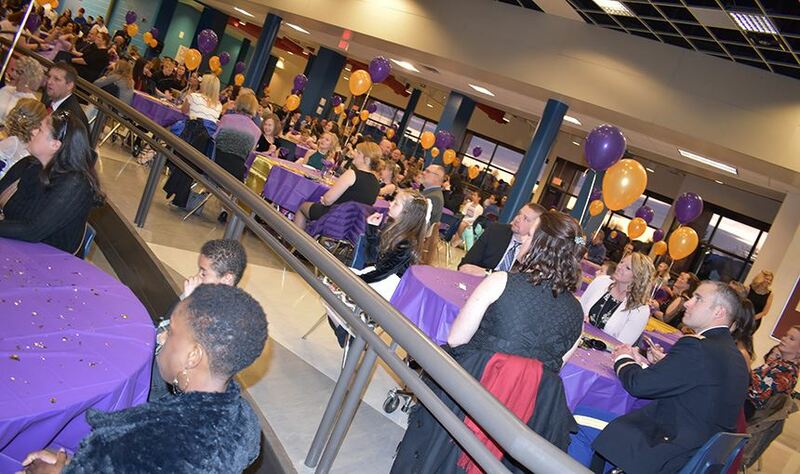 Ninety-two purple-gowned seniors kicked off the District 49 graduation season the morning of Friday, May 18. 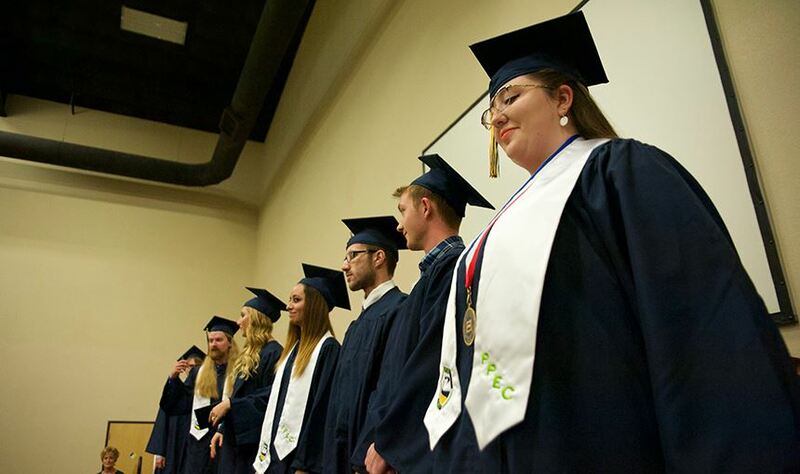 Twenty-seven graduates from Patriot High School were commended for their success during a ceremony May 18. 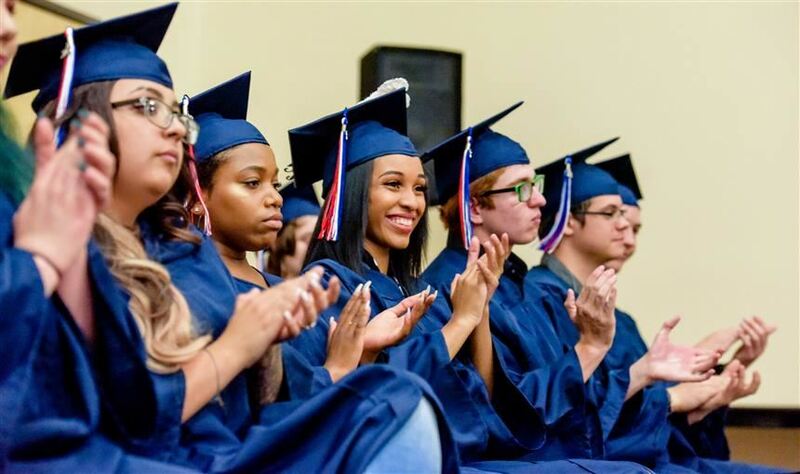 The graduation took place at Creekside Success Center and highlighted accomplishments of the students and encouraged them for what is yet to come. A small team of School District 49 leaders put their shoveling skills to work on a breezy Tuesday afternoon. The Board of Education will hold a work session at 6:30 p.m. on Wednesday, April 24, 2019 in the board room at the Education Service Center. The agenda and revised packet are available for download. 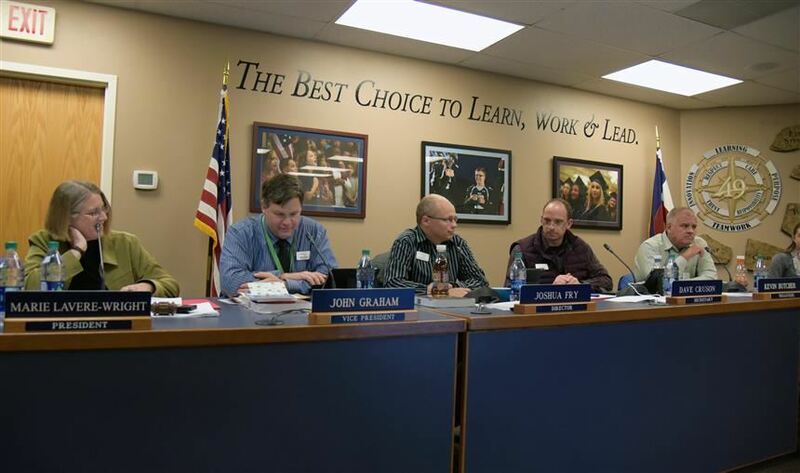 The Board of Education held a regular meeting at 6:30 p.m. on Thursday, April 11, 2019 in the board room at the Education Service Center, 10850 E. Woodmen Road, Peyton. The agenda and revised packet are available for donwload. Audio files are available for download. 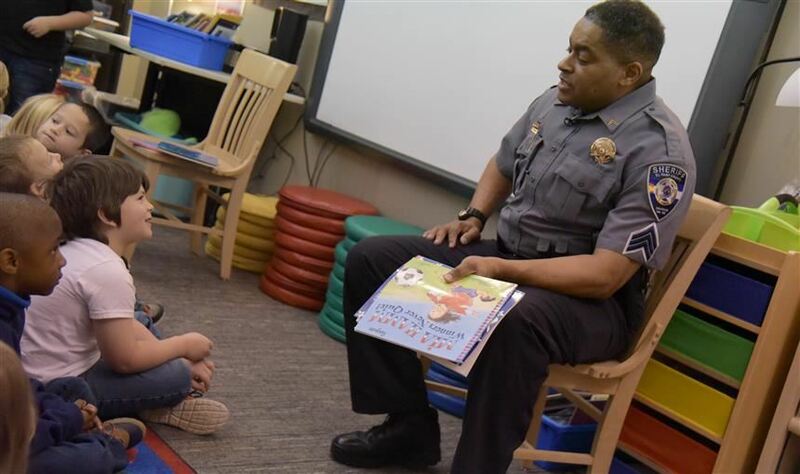 District 49 prepares students, in a safe and caring environment, to be successful, competent and productive citizens in a global society. 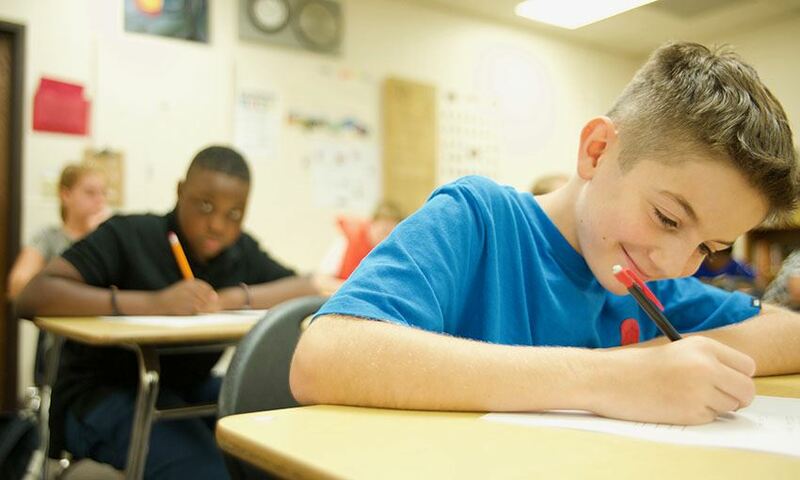 Our teachers, administrators and staff members are committed to the creation of educational environments where all children can maximize their individual learning potential. Further, we are committed to meeting students' needs in all domains: academic, social and physical. 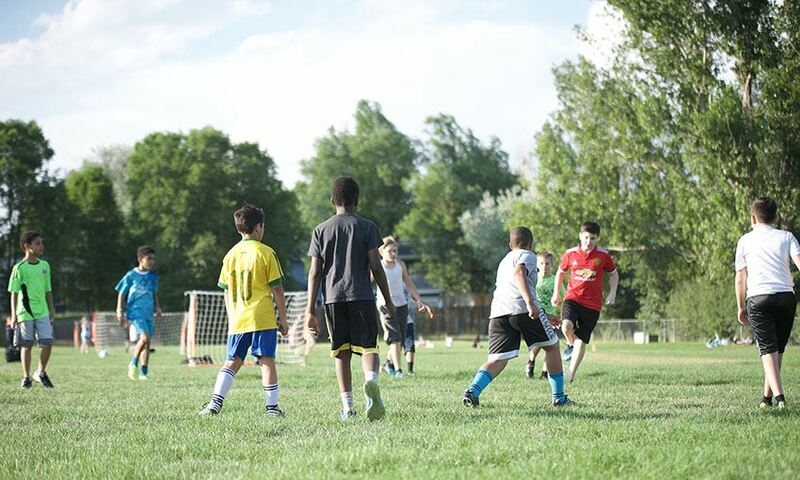 An emphasis in all activities will be toward empowering students to take an active role in their own learning.